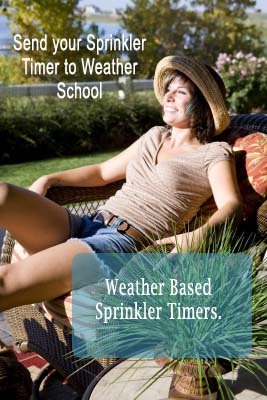 Many people get frustrated when they see sprinklers on when its raining. It wastes water. To solve this problem rain shut-off devices are installed connected to sprinkler controllers. But, they do not have the best reputation. As with most problems there are good-better-best solutions. I have been in this industry for 35 years, I consider a rain shut-off device to be a good solution. The problem is, they either don't work or they let the sprinklers resume watering too soon after the storm is over; but they are better than nothing. The better solution, and what many people do, is turn the sprinkler controller off when it rains, then wait until watering is needed again before turning it back on. This means someone must go and shut off the controller, watch the landscape, then go an turn the irrigation controller back on. ; that can be a lot of work. Now for the best solution. I love easy and I love technology. Let climate controlled irrigation manage your watering. Now, be careful, not all smart controllers are the same. Too many of our competitors just use a rain shut-off device. Why, because they are cheap. Weather Reach smart irrigation control uses a rain gauge to measure how much rain fell. This is the best way to go. When rain is measured Weather Reach smart controllers know how much rain was effective. This means it will turn off watering when it rains and keep it off until the landscape needs to be watered again. This is so much better, no worries and you save money. As I write this I am reminded of a phone call I had from a customer. His sprinklers came on while it was raining. I checked his logs, it had rained and it did water. But, it only rained 0.04" of an inch. Think about it, 0.04" of rain is not a lot of water. It was not enough rain to warrant shutting off the system, Weather Reach was keeping track and it knew the storm was very light. Interestingly enough I have been watching the same customer's site. Lately it has been raining off and on for the last 6 weeks. Weather Reach has not watered at all during that time. The landscape didn't need it. Weather Reach smart irrigation control saves water, saves money, takes a worry out of your life and sustains a healthy landscape, because it is watered right.